People have all types of reasons to sell their old, unwanted or broken jewelry from just simply needing some extra cash, down sizing their lives, inheriting jewelry that just not fit their taste or lifestyle and so on. So when this moment arises many people are left wondering where is the best place to sell jewelry. 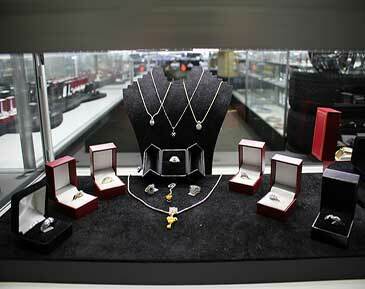 Local pawn shops can offer a great alternative to trying to sell online, at a yard sale or a Cash 4 Gold shop. Most Pawnbrokers have a licensed gemologists on-site that can assist in determining the authenticity and value of your jewelry. So how do you get the best price on jewelry when you are selling to a pawn shop? This is the million dollar question right or 100 dollar question depending on the jewelry you are trying to sell. First – Knowing what types of jewelry most pawn shops are willing to buy is a good place to start that is junk jewelry, knock offs, fakes, stolen jewelry (yes pawn shops routinely report their purchases to local law enforcement and most reputable pawn shops want to maintain a positive reputation in the public’s eye) are not going to be on the top of most pawn shops lists and will most likely lead to wasting your time and theirs. Karat – Is the measure of the purity of gold this lets you and the pawnshop know if there are any additional metals (Usually Copper) within the gold itself. You can usually find a stamp on gold jewelry that will tell you what karat it is. Karats range from 24 Karat -which is the top of the purity chart all the way down to 9 karat. Weight – This can be done at home with a basic kitchen scale. Most precious metals are weighted by Ounce/oz, Grams/gm and Kilograms/kg. Price – Once you have determined the weight you can check current prices on whatever the precious metal your jewelry is made from here. Third – Knowing the jewelry style and designer can also make a difference as old out of fashion jewelry pieces will probably be sold as scrap while top sought after designers and designs can fetch a higher price. Fourth – Find a reputable pawnshop nearby that has an experienced staff who knows the ins and outs of selling used jewelry as they can not only give you a good price but explain how the came to that price. Why is it so important to find a reputable buyer? As we said before pawn shops are regulated by local, state and federal authorities and selling your jewelry to someone who is not regulated by the legal system can bring with it some hazards that are best avoided including bait and switch of your valuable stones, getting a low ball price, damage to your jewelry, and of course theft. Also maintaining a good reputation and getting customer referrals is important to any business including a pawn shop so it is a good bet that you will be treated fairly and valued. Do pawn shops buy jewelry that is made from other metals like silver or platinum? What about selling jewelry that is broken? When it comes to valuating jewelry that is broken in most cases the weight of the metal and the spot price is what is used to determine what a pawn shop will pay. However if it can be repaired easily and the design or designer is in high demand then you may be able to get a bit more than simply the weight value. How are precious stones like diamonds and rubies factored in to the price? Precious stones or gemstones like Diamonds, Rubies, Emeralds, Sapphires, and so on are valued based on a few factors. Carat – Just like gold gemstones are valued based on their weight, for a quick tool to measure the weight of your gemstone click here. Most pawn shops will have a jewelry scale on site which will help them determine the exact weight right on the spot. However weight is not the only factor. Gemstone Color – The color of your precious stone plays a significant role in determining its value. The most sought after colors are different for each gem type, those being more rare or more desired will obviously fetch a higher price than those that are more common or less in demand. Highly vivid gemstones that are truly pure to the eye and are medium in tone are more highly regarded than those that are too light or dark. Shape and Size – A gemstones size can effect the value beyond its weight for some particular gemstones like the diamond or ruby which can increase significantly from one size to the next where as more common gemstones are pretty consistent in price per carat no matter what the weight. The shape is also a key factor as the more unusual or rare the shape the more valuable it tends to be. This is due to what it takes to cut the stone to a particular shape and also the beauty and desirability in general of particular shapes. The Cut and Polish – The gemstones cut contributes to it’s ability to reflect light creating a more bright and sparkle effect. It takes great skill to cut a gemstone and certain stones can be more difficulty to cut than others. The better the shine and cut the more valuable the gem is in most cases. There are several other factors that play a role in how a pawnshop will value your gemstones including rarity and demand so it is a good idea when taking your jewelry into a pawn shop to ask them how they have come to the value they are proposing. In summary finding a safe buyer that knows how to properly value jewelry from value of metal and stone to desirability and sell-ability in a retail market is generally going to be your best bet in getting a good price without endangering yourself or your jewelry. If you are looking to sell your jewelry and live in or around Ontario, Pomona, Upland or the surrounding communities and want to sell your jewelry or simply want to know how much you could get for it give the professionals at Central Mega Pawn a call or visit our showroom and a member of our team help. Where Can I Sell My Loose Diamonds? Do Pawn Shops Buy High-End Fishing Gear? Jewelry Store vs Pawn Shop: Which is the Best for You? Do Pawn Shops Loan Money on Electronics?